In the opening fixture of I-League 2017, Aizawl FC failed to register a narrow win over Kolkata giants East Bengal FC yesterday conceding an 89th-minute goal and drawing the match. Afterward, in the post-match conference, Aizawl head coach Khalid Jamil made it clear he was not at all happy with the final score and also admitted the last set piece, taken by East Bengal midfielder Mehtab Hossain cost the team three points. 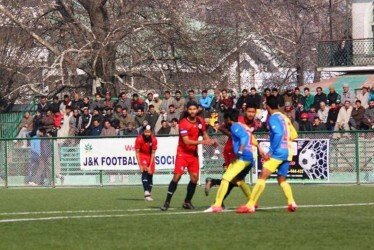 Despite the result, Jamil praised the efforts of the entire Aizawl team. “We were very good. Attacking was very good, defending-wise we were good also,” said Jamil. While the coach previously warned that the first match of the season is always tricky, especially against teams like East Bengal, the reality differed from his statement several times in the entire match. 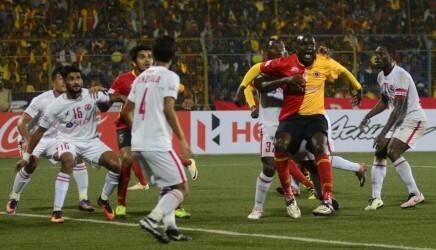 The Aizawl forwards went on countering East Bengal several times, but could not finish the chances. Whereas the East Bengal forwards were toothless in front of the Aizawl defense, especially against Eze Kingsley Obumneme who went on to be awarded the Hero of the Match. “I don’t know how this happened. 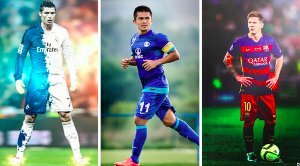 I am sure this was some miscommunication which is why this happened.” However, later the East Bengal players and coach Trevor Morgan appealed to the referee but the match had already been concluded by then. The Aizawl FC head coach was asked if he considers East Bengal to be title contenders this year. “I haven’t really thought about it. No, I don’t know” said the Kuwait-born Jamil. He also revealed that he is rather thinking about his team’s improvement in the coming matches as there were several flaws present in his team’s gameplay. When asked about the flaws, “Lack of marking. It lead to us concede the goal,” he answered. 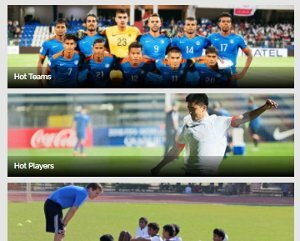 The Mizoram-based team will play their next match against I-League newcomers Minerva Punjab FC on 13th January in their home turf, Rajiv Gandhi Stadium in Aizawl.